You are here: Home / Breeds / Cane Corso Lab Mix: Would This Big Hybrid Suit Your Home? The Cane Corso Lab Mix stands proudly among the larger inhabitants of dogdom. As an Italian Mastiff, a Cane Corso is among the most agile big dog breeds. They’re also gentle and affectionate with proper care and love from their families. When combined with the loving Labrador, the results can range from solemnly interesting to wildly hilarious. Where did this large mix come from? What are they like? And what should any interested person know about these princely and sometimes clownish dogs? Where Does the Cane Corso Lab Mix Come From? The Cane Corso Lab mix, like many mixes, cannot be pinned down to an exact time and place. What we can do is take a close look at the parents of this mix and where they came from. One of the oldest purebreds, the Cane Corso dates far back in history. To add to their misty origins, they lived in the far corners of Italy as Roman war dogs. The Cane Corso almost disappeared in the 1970s before a devoted group of afficionados brought them back. On the other side of the family tree, the Labrador Retriever dates back to Newfoundland in the 1700s. In the 1800s, they were taken to England and bred for sport and hunting. Today they are the AKC’s most frequently registered breed, and a beloved family pet all over the world. While not as many fun facts exist about this mix as some other breeds may have, a few do exist. Because Cane Corsos are very dignified dogs and Labradors are not, a Cane Corso Lab mix may be as solemn as a prince or as goofy as a clown. The larger size of these dogs and the variety of facial shapes create some interesting combinations as well. Such a combination will always provide loving amusement and intriguing collections of traits. So are these dogs alike, visually and practically speaking? Cane Corso Lab Mixes tend to be about 22 to 28 inches in height. Males are usually taller than females by about three inches or so. They weigh anywhere from 55 to 100 pounds. Their coats may be black, brown, gold, brindle, blue and grey. A Cane Corso Lab mix eye color is the same story: blue, hazel, brown and amber eyes all exist in these pups. As for their coats, they tend to be short, straight, easy to care for and clean. What kinds of temperaments can you expect from a Cane Corso Lab Mix? Though this varies widely by each dog and by training as pups, a few things can be generally expected. One fact holds constant: These dogs will be a mix of both parent breeds and those temperaments. What are those? Labs are known for being happy-go-lucky, affectionate and playful. They are usually easy to train and love being around family. From small children to teens, other dogs and pets, Labs generally adapt well and find their place in the home quickly. On the other hand, Cane Corsos are a very different kettle of fish. These dogs were first guard dogs and fighters, traits that have not been bred out of them. Unlike other dogs, Cane Corsos are still very connected to their ancestral traits. Because of these traits, they are known to be more dominant and territorial. This does not necessarily translate into aggression. Cane Corsos are highly intelligent and want to please you. One of the beauties of the Cane Corso Lab mix is that it can have any of these above traits. That is also one of the downsides of this breed. Proper training is a must. A Cane Corso Lab mix’s unique collection of parental traits means they’ll need your help to maximize this. Let’s start with the daily needs of the Cane Corso Lab mix and how training impacts these needs. Even though they are a Lab cross, individual dogs can be a challenge to train. Because of this fact, a Cane Corso Lab mix may not be a great first pup for a new owner. The protective drive of these dogs should also be considered while you train them. Your pup may become a one-person dog. This has drawbacks when you need to be away or take them to a vet. They should also be acclimated to other dogs, children, adults and common situations during their training in a deliberate fashion. Because both parent breeds were working dogs, these pups have notable guarding and protecting instincts. This may or may not be appropriate for your family and situation. These dogs do best with a strong, positive training plan to keep everyone happy, productive and safe. A great place to start is on our training tips and guide page. How healthy are these dogs? What does a good daily care plan look like for them? And what should you expect to hear from your vet in the event of trouble? These dogs are fairly healthy and do not have known special needs. Their most common major concerns are gastric dilatation volvulus, ectropion, hip dysplasia and entropion. Minor concerns include cataracts and elbow dysplasia. In layman’s terms, this means that these dogs are prone to eye, stomach and joint troubles. As with most dogs, regular vet visits to a trusted professional will go a long way to prevent any major health concerns and reducing minor issues. Some tests that may be recommended or requested are various types of blood work, a joint fluid sample and corneal staining. While the potential health problems of your newest family member or candidate should be considered, no major health reasons bar Cane Corso Lab mixes from a happy, long and healthy life. Do Cane Corso Lab Mixes Make Good Family Dogs? The initial answer to whether Cane Corso Lab Mixes are good family dogs is a tentative yes. However, that can change very quickly depending on your family and home. Cane Corso Lab mixes are wired to be watch and guard dogs. They are not wired to be companion dogs, nor are they bred in a way that balances out these traits with playfulness or clownishness. This can and will change by dog and pup. But the basics remain the same: This is a working dog. But these family-friendly dogs are highly intelligent and receptive to training. They want to please you. 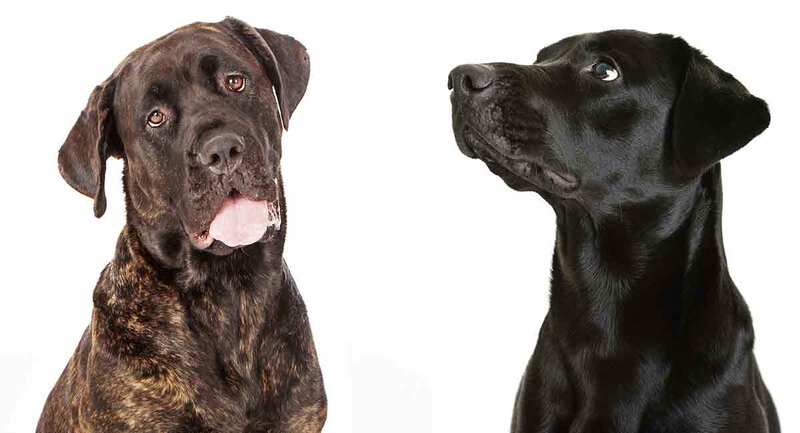 If you can provide the structure that these dogs need; know of a great third-party trainer; are ready for a patient and loving challenge, a Cane Corso Lab mix may be the right dog for you. A Cane Corso Lab mix, which is more like the Lab parent, is also an option in these case. However, it can be hard to tell when they are puppies or by your first impressions of adult dogs. If you can embark on a long, loving and intensive training program, these dogs will deliver almost whatever you want to the very best of their ability. Rescuing the newest member of your family is always an amazing option for all. How does one go about it? You do have options apart from your local shelters and/or pounds. Try talking with reputable breeds and focus dog groups. Sometimes, people need to give up a loved animal and don’t want to send it to a cold, unloving, “holding” place. And dog lovers everywhere want each pup to have a happy home. Tap into your local networks and check out the usual places. Moving on to more specific situations, how do you find a Cane Corso Lab mix puppy in particular? Great places to start are with focus groups around the Cane Corso parent. Because Labs and Lab mixes are so popular, it’s better to start with the other parent of this mix. You can also use our puppy search tool to find information on a forever pup. Because this is an uncommon mix and one of the parents is a very uncommon breed, these pups may be difficult to find where you are. This can lead to searches on the Internet and other remote ways of finding a Cane Corso Lab mix puppy. While these can be perfectly fine and good, please use caution to avoid puppy mills and unethical sellers. These places do not care about the puppies or the parents. Instead, they are simply out to make as much money as possible off of you and the dogs. This does no one any favors and is highly suspect at the best of times. Make sure that if you go directly to the breeder that they have appropriate documentation and care for their dogs. Raising a puppy, whether this is the first time you’ve started or much farther down the road, can seem overwhelming at best. On the other side of the spectrum, it can feel downright impossible. Use our puppy training and tip page to try to decrease that overwhelming feeling. With professional, practical help and a little time, you’ll be ready to provide a wonderful experience for your new puppy. In summary, what are the pros and cons of adding a Cane Corso Lab mix to your home and/or family? What other mixes are similar to the Cane Corso Lab mix? Breeds with similar maintenance, training, and guard/watch capacities include the Pit Heeler, the Pharaoh Hound and the Pointer. Breeds that are similar in size include the Curly Heeler, the Slovensky Cuvac and the Sarplaninac. Another option is to see what is available on such places as farmhouses, amateur breeders and other families. These places may have similar mixes without any grand names or categories. How can I rescue a Cane Corso Lab mix? Unfortunately, because this mix is so rare, it’s very difficult to create a list of places to look for a Cane Corso Lab mix to adopt. A good place to start is with any focus groups for Cane Corso lovers and/or breeders. These people are tapped into the network of at least one of the parent breeds and may help you with your search. Is a Cane Corso Lab Mix Right for Me? Traits, personal stories and fun dog facts can often depend on each individual dog. Only you can make the decision about whether this mixed breed is for you. If you want a loyal, affectionate dog that you will commit to training and caring for, a Cane Corso Lab mix might be right for you.